Oliver, BC (December 14, 2016) – Christmas is coming to the South Okanagan. Visit Restaurant with friends and family for a cozy Christmas Eve dinner ($39) that includes spiced pumpkin soup with yogurt and fennel pollen, followed by a duo of turkey – roast breast and confit leg croquette – crab apple compote, brown butter potato puree, Brussel sprouts and gravy, and a plum frangipani tart to finish. 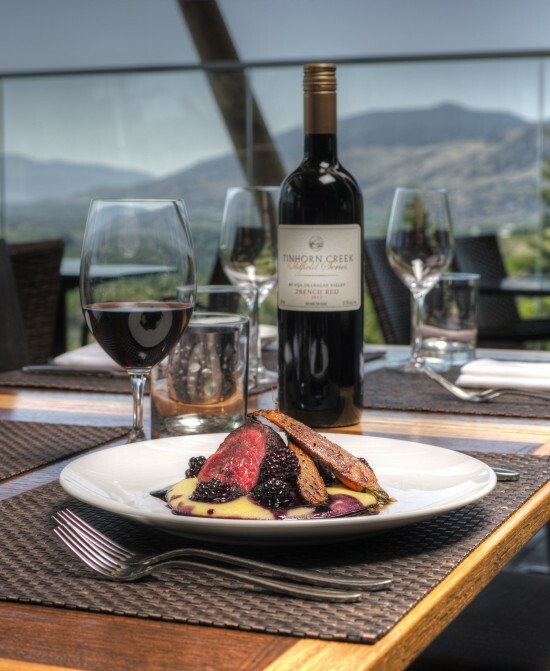 Wine pairings ($30pp) are available to complete the pre-Christmas celebrations. Miradoro is also the perfect place to ring in 2017 and dance the night away with our live DJ. Celebrate New Year’s Eve with a special menu crafted by Chef Jeff and his team, including an oyster and bubbly reception and wine-paired appetizers such as venison crudo with preserved plum and sunchoke or mushroom brodo with tortellini. Entrées include ling cod with winter squash, Dungeness crab risotto and heirloom tomato jelly or grilled bottom sirloin with oxtail croquette, amarosa potato terrine, roast shallot and truffle agrodolce. For a sweet start to 2017, enjoy a special dolce platter and a complimentary glass of bubbles at midnight (Menu $65, $30 for wine pairings). Call 250-498-3742 for reservations. Miradoro is open 11:30am to 9pm daily until December 31, 2016 and closed for January and February, re-opening March 1, 2017 with a new spring menu and special prix fixe three-course dinner menu ($30pp) for the month of March. Tinhorn Creek’s tasting room is open 10am to 5pm daily until December 31, 2016, and 10am to 4pm daily in January and February, 2017 (closed Christmas Day and New Year’s Day only). For more information about Miradoro Restaurant visit http://www.miradoro.ca.